Sleep–wake abnormalities are common in patients with Alzheimer's disease, and can be a major reason for institutionalization. However, an emerging concept is that these sleep–wake disturbances are part of the causal pathway accelerating the neurodegenerative process. Recently, new findings have provided intriguing evidence for a positive feedback loop between sleep–wake dysfunction and β-amyloid (Aβ) aggregation. Studies in both humans and animal models have shown that extended periods of wakefulness increase Aβ levels and aggregation, and accumulation of Aβ causes fragmentation of sleep. This perspective is aimed at presenting evidence supporting causal links between sleep–wake dysfunction and aggregation of Aβ peptide in Alzheimer's disease, and explores the role of astrocytes, a specialized type of glial cell, in this context underlying Alzheimer's disease pathology. The utility of current animal models and the unexplored potential of alternative animal models for testing mechanisms involved in the reciprocal relationship between sleep disruption and Aβ are also discussed. Alzheimer's disease (AD) is an irreversible brain disease characterized by the presence of neurofibrillary amyloid plaques and hyperphosphorylated tau tangles that results in progressive dementia associated with memory loss, cognitive impairment, sleep disturbances, and other behavioral abnormalities. AD is the most common form of dementia; and although AD is not part of the normal aging process, aging is the greatest risk factor for developing AD. Several other factors are known to affect AD risk, and include genetic variants of apolipoprotein E (ApoE), or mutations in genes encoding amyloid precursor protein (APP) or the presenilin proteins (PS1, PS2). The ApoE genotype is the strongest known genetic risk factor for sporadic late-onset AD, with the ε4 allele contributing to the most genetic risk (Holtzman et al., 2012). Rare, early-onset autosomal dominant familial forms of AD caused by mutations in APP, PS1, or PS2 share similar pathology with sporadic forms of AD, most notably aggregation of β-amyloid (Aβ) peptides. These familial forms of AD-associated mutations increase production of toxic forms of Aβ and can be genetically reproduced in many different animal models (Van Dam and De Deyn, 2011). In this review, we will discuss the current state of AD research across many different animal models and highlight the unique opportunities offered by these models to study the molecular, cellular, and behavioral linkages in the pathogenesis of AD. In addition to the genetic predisposition for AD, a newly emerging idea is that disruption in sleep and/or circadian rhythms may be a principal component of the causal pathway leading to AD pathogenesis, as well as in accelerating AD progression through a reciprocal, positive-feedback loop relationship (Gerstner et al., 2012; Roh et al., 2012; Ju et al., 2014; Lim et al., 2014; Musiek and Holtzman, 2016). This review therefore focuses primarily on AD models using Aβ, and the potential for their application in the study of the associations of Aβ accumulation with sleep behavior. A critical understanding of the molecular and cellular mechanisms responsible for a feedback relationship between sleep, Aβ, and AD pathophysiology is lacking. Although there have been many reviews covering the topic of sleep–wake disturbance and AD (Lim et al., 2014; Lucey and Bateman, 2014; Peter-Derex et al., 2015; Mander et al., 2016; Mattis and Sehgal, 2016), the current review highlights a central role for astrocytes, a specialized type of glial cell, as a mechanistic link in AD pathophysiology. Also not previously reviewed, we will discuss a broad range of AD animal models (vertebrate and invertebrate species) used in the study of the interactions among sleep disruption, amyloid deposition, and AD pathophysiology. We will then present a unifying hypothesis for a potential mechanism underlying the reciprocal sleep-Aβ-AD relationship involving astrocytes. Last, we will conclude with a discussion on future directions of research using novel animal models in this newly burgeoning area. Sleep–wake and circadian dysfunction are prevalent in AD (Pollak and Perlick, 1991; Vitiello and Borson, 2001; McCurry and Ancoli-Israel, 2003; Bliwise, 2004). Insomnia at night and excessive daytime sleepiness affects 25%–40% of patients with mild to moderate AD and their caretakers (McCurry et al., 1999; Moran et al., 2005). Compared with healthy older adults, individuals with AD spend more time in bed awake and experience more fragmented sleep (Prinz et al., 1982a,b). A recent prospective study indicated that sleep fragmentation increased risk of cognitive decline and incident AD (Lim et al., 2013). During an early stage of AD called mild cognitive impairment (Schneider et al., 2009), evidence is emerging to suggest that sleep disturbance may precede a clinical diagnosis of AD years in advance (Hita-Yañez et al., 2012; Westerberg et al., 2012). One study used both objective and subjective measures of sleep to compare healthy elderly with subjects with mild cognitive impairment, and observed shorter bouts of REM sleep and increased slow-wave sleep fragmentation in subjects with mild cognitive impairment (Hita-Yañez et al., 2013). The disruption in REM sleep was exacerbated in Apoε4 carriers compared with noncarriers, suggesting that, even at a preclinical stage, sleep disturbance exists in individuals with increased risk of developing AD. This raises the possibility that sleep may be sensitive during the preclinical period, and sleep disturbance itself may provide a biomarker of potential AD risk and also be a contributing factor to the progression of AD. Less robust circadian rhythms may also predict risk of developing AD in cognitively normal older women, suggesting a possible relationship between sleep, circadian function, and AD (Tranah et al., 2011). Sleep disturbance before any cognitive impairment in the earliest stages of AD is a newly emerging idea and an area of current research needing more attention. A reciprocal relationship between sleep disturbance and AD progression likely involves the accumulation of Aβ plaques (Kang et al., 2009; Gerstner et al., 2012; Roh et al., 2012; Ju et al., 2014; Lim et al., 2014). Aβ plaques consist of insoluble forms of normally soluble amino acid peptides derived from proteolytic cleavage of the APP (Palop and Mucke, 2010). Reduced levels of soluble Aβ in the CSF have been considered a biomarker for preclinical AD because it indicates the presence of increases in Aβ plaque formation (Fagan et al., 2006; Sperling et al., 2011). Longitudinal studies of sporadic and genetically inherited AD have shown reduced Aβ levels occurring before AD-associated cognitive symptoms by ≥15 years (Price and Morris, 1999; Bateman et al., 2012). To determine whether sleep disruption is associated with Aβ deposition in preclinical AD before cognitive impairment, Ju et al. (2013) analyzed sleep measures with CSF Aβ42 levels in cognitively normal individuals that included subjects with and without a parental history of late-onset AD, and found that low CSF Aβ levels were associated with worse sleep quality in preclinical AD. Similarly, another study found self-reported shorter sleep duration and poor sleep quality associated with greater Aβ plaque formation (Spira et al., 2013). Together, these studies suggest that sleep disruption occurs when amyloid plaques are forming but before cognitive dysfunction (Spira et al., 2014). Astrocytes are “neuroglia” with diverse functional roles in physiological processes, such as aging, inflammation, disease, homeostasis, and CNS repair (Sofroniew, 2009; Parpura et al., 2012; Verkhratsky et al., 2013; Rodríguez-Arellano et al., 2016). Astrocytes have also been shown to be critical regulators of sleep behavior, across many diverse species, including flies, mice, and humans (Halassa et al., 2009; Clasadonte et al., 2017; Farca Luna et al., 2017; Gerstner et al., 2017b). A primary function of astrocytes may be to regulate the metabolic demands of neurons by a mechanism termed the astrocyte-neuron-lactate-shuttle (ANLS) (Pellerin and Magistretti, 2012) tied to the sleep–wake cycle (Gerstner et al., 2012; Lim et al., 2014). Although controversial, the central premise of the ANLS is that lactate release from astrocytes is closely tied to glutamatergic (excitatory) synaptic activity, and this lactate works to meet the metabolic needs of neighboring neurons as an energy substrate, derived from glycolysis in astrocytes. Genes associated with this process in the ANLS have been shown to be regulated in cortical astrocytes following sleep deprivation in mice (Petit et al., 2013), suggesting astrocytes link neurometabolic coupling to the sleep–wake cycle. Further support for this idea is that a reciprocal relationship between oscillations in lactate and glucose is associated with normal sleep–wake behavior, where wakefulness is associated with increases in glutamate and lactate, and a simultaneous reduction in glucose levels (Dash et al., 2009, 2013; Naylor et al., 2012). During sleep, changes in neural activity patterns are observed throughout cortex, as observed from EEG recordings (Vyazovskiy et al., 2009). The neuronal activity patterns during EEG-defined slow-wave sleep stages are associated with a reduction in global glucose utilization (Nofzinger et al., 2002). Together, this evidence supports that ANLS mechanisms change over the sleep–wake cycle, where increases in glutamatergic tone associated with wakefulness promote lactate release and glucose utilization. How might astrocytes and sleep-related ANLS mechanisms be tied to Aβ clearance in AD pathophysiology? In mice, astrocytic expression of the proteins low-density lipoprotein receptor (Basak et al., 2012) and ApoE (Verghese et al., 2013) regulate the uptake and degradation of Aβ species, whereas astrocyte dysfunction promotes Aβ aggregation. For example, disrupting normal astrocyte activation via deletion of glial fibrillary acidic protein and Vimetin enhances Aβ aggregation, whereas enhancing astrocytic autophagic processing via transcriptional factor EB overexpression mitigates amyloid plaque pathology in mice (Kraft et al., 2013; Xiao et al., 2014). Aβ clearance is also impaired by silencing of low-density lipoprotein receptor-related protein 1 in astrocytes, and low-density lipoprotein receptor-related protein 1 regulates levels of certain Aβ degrading enzymes (Liu et al., 2017). Increased wakefulness and neural activity regulate extracellular Aβ levels in rodents (Bero et al., 2011; Roh et al., 2012) and flies (Tabuchi et al., 2015). In the absence of aggregation in mouse models, diurnal oscillations in Aβ are tied closely to the sleep–wake cycle and wake-related lactate levels (Roh et al., 2012), whereas neural activity and wakefulness in turn increase Aβ release (Kang et al., 2009). Evidence suggests that endogenous neural activity regulates regional changes in interstitial Aβ, driving local Aβ aggregation, which is associated with the concentration of lactate (Bero et al., 2011). This supports the idea that the ANLS may be perturbed in AD (Newington et al., 2013) due to Aβ-induced changes in lactate metabolism. It is plausible that clearance of wakefulness-associated Aβ would be facilitated during sleep periods by astrocytes and other glial cells, and prevent Aβ oligomerization and aggregation (Fig. 1). Indeed, support for this idea was shown by sleep-associated reduction in Aβ through glymphatic processes involving astrocytes (Xie et al., 2013). Recently, it was shown that state-dependent brain lactate levels are controlled by glymphatic clearance in mice (Lundgaard et al., 2017). Impairing glucose and lactate trafficking through astrocytic networks silenced wake-promoting neurons and causes nocturnal sleepiness in mice (Clasadonte et al., 2017). Together, astrocytes are uniquely positioned to regulate sleep and Aβ clearance mechanisms tied to the ANLS. Mechanisms linking sleep and Aβ aggregation: an astrocytic hypothesis. A, In the soluble state, Aβ has been shown to have diurnal oscillations associated with the sleep–wake cycle (Roh et al., 2012). Neuronal activity and wakefulness are thought to increase Aβ release from neurons. Mechanisms that may reduce extracellular levels of Aβ during sleep periods, such as ApoE-derived Aβ-clearance from astrocytes and other glial cells, would prevent Aβ oligomerization and aggregation. Oscillations of lactate are coupled with normal (balanced) behavioral changes in the sleep–wake cycle (Naylor et al., 2012) and extracellular Aβ levels (Roh et al., 2012). The ANLS hypothesis proposes that astrocytic uptake of activity-dependent glutamate release at synapses in turn triggers glucose uptake, which is then converted to lactate and supplied back to neurons to facilitate metabolic demand (Pellerin and Magistretti, 2012). B, Sleep decline, as occurs with normal aging, may slow Aβ-derived clearance mechanisms while simultaneously promoting the further release of wakefulness-induced Aβ release, thereby permitting Aβ oligomerization and subsequent plaque formation. The plaques would serve as a “sink” for Aβ oligomers, generating an Aβ concentration gradient. This Aβ gradient would attract astroglial-derived clearance mechanisms, mobilizing glia and preventing normal ANLS coupling, and the establishment of the underlying pathology of Alzheimer's disease. Without proper functioning astrocytes, excessive wakefulness would further increase glutamate release and generate excitotoxicity damage, leading to neurodegeneration and cognitive dysfunction. 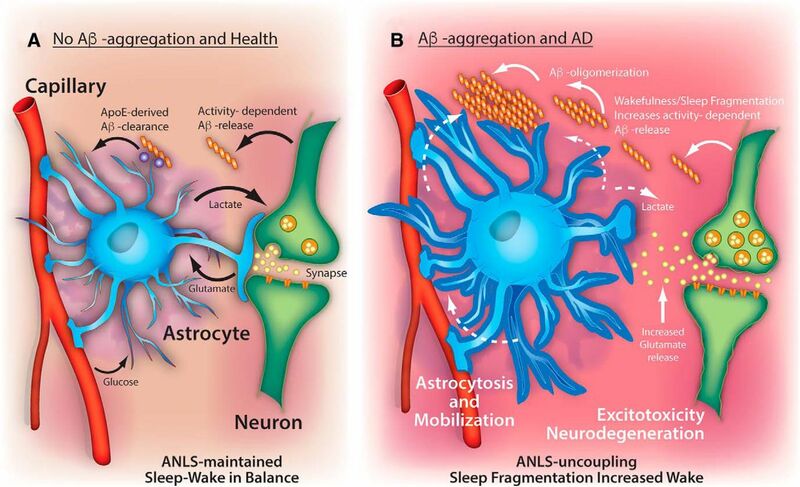 Thus, dysfunctional ANLS coupling would aggravate a vicious cycle linking sleep fragmentation with Aβ release, amyloid plaque formation, and progressive neuronal loss. We hypothesize that, in normal aging, neurometabolic coupling through the ANLS maintains a balance in Aβ production and clearance during sleep (Fig. 1A). Given the normal decline in sleep with age, astrocyte-derived clearance of Aβ may be slowed. Slowing of clearance may increase the chance of Aβ oligomerization and aggregation. Plaque formation would attract newly formed Aβ oligomers and thus become a “sink” to generate an Aβ concentration gradient (Fig. 1B). These Aβ gradients may attract astrocyte- and other glial-derived Aβ clearance mechanisms (e.g., microglia), promote astrocytosis, and mobilization away from glutamatergic uptake at synapses, preventing the ANLS. A recent examination of postmortem human cortex describes mislocalization of astrocyte expressed aquaporin-4 in perivascular astrocytic endfeet associated with Aβ aggregation in AD (Zeppenfeld et al., 2017). These astrocyte endfeet may play a crucial role in neurovascular dysfunction associated with AD (Kisler et al., 2017). Astrocytes may also respond to plaques by changing phenotype, rather than location (Galea et al., 2015), suggesting that morphological changes in astrocytes may affect perisynaptic astrocytic responses, consistent with our model (Fig. 1). Astrocytes remove excess glutamate from the synapse to reduce the impact of glutamate toxicity (Coulter and Eid, 2012), a mechanism implicated in AD rodent models (Scimemi et al., 2013). The movement of astrocytes away from synapses alone may account for neuronal impairment though glutamate toxicity. However, ANLS uncoupling may also allow glutamate spillover, which would facilitate and increase surrounding synaptic excitability, excitotoxicity, and neurodegeneration. This final step is supported by findings that Aβ can induce glutamate release from astrocytes, leading to synapse loss (Talantova et al., 2013), and that Aβ alters metabolic functions of astrocytes (Allaman et al., 2010). These events promote further wakefulness-induced Aβ release, aggregation, and ANLS uncoupling, establishing a vicious cycle underlying AD pathology. This suggests that therapeutic strategies that prevent the localized astroglial response to Aβ aggregates and/or that target the maintenance of an intact ANLS may represent an avenue for treatment of AD. Studies in rodents have shown that activated astrocytes can assume a neurotoxic phenotype upon exposure to certain cytokines, at which point they begin to express complement protein C3 and contribute to inflammation and synapse engulfment (Chung et al., 2013; Liddelow et al., 2017). However, activated astrocytes can also be diverted toward more protective polarization in certain settings (Chung et al., 2013) and may comprise multiple subtypes, which may vary in their response under different challenges (John Lin et al., 2017; Liddelow and Barres, 2017). It remains unknown how many different polarization states of astrocytes exist, and how these different astrocyte activation states impact Aβ uptake, ANLS function, or sleep. Further exploration of therapeutic strategies to optimize astrocyte activation state may have important implications for the treatment of AD and other neurodegenerative diseases. Elucidation of astrocyte signaling pathways could potentially be exploited to promote the neuroprotective actions of astrocytes (e.g., Aβ clearance and neuronal metabolic support) and prevent the damaging aspects of astrocyte activation (e.g., inflammatory cytokine production and synapses engulfment). Disruption of the circadian clock via deletion of the master clock gene Bmal1 in mice leads to massive astrocyte activation and inflammation (Musiek et al., 2013). This finding suggests that circadian rhythm dysfunction could promote neuroinflammation and Aβ accumulation due to astrocyte activation, although this has not yet been proven. However, altered Bmal1 expression has been noted in human AD brain tissue (Cermakian et al., 2011; Cronin et al., 2017) and AD mouse models (Song et al., 2015). ApoE genotype is one the strongest genetic risk factors for AD. It is notable that astrocytes are a major source of ApoE, and that different ApoE isoforms influence astrocytic synapse elimination (Chung et al., 2016). The Apoε4 allele has been shown to impair autophagy, a process involved in protein degradation, in astrocyte cultures, and this effect was associated with a reduced capacity to clear Aβ plaques (Simonovitch et al., 2016). Interestingly, sleep deprivation severely impairs the delivery of ApoE particles to the brain due to diminished glymphatic flow (Achariyar et al., 2016), suggesting a possible link between sleep, ApoE, astrocytes, and synaptic homeostasis. Thus, the influence of sleep and circadian rhythms on astrocyte function and astrocyte-neuronal coupling has clear implications for the pathogenesis of AD. There now appears to be an association between sleep and circadian mechanisms related to Aβ deposition and aggregation, underscoring the importance of using AD animal models in understanding their functional relationship in Alzheimer's disease pathophysiology. However, to rigorously test the relationship between sleep and clocks in a cell-specific manner, and in the context of this mechanism (Fig. 1), requires the use of AD animal models with a strong genetic tool-kit. The development of model organisms to study AD has provided researchers with numerous ways to examine the genetic, molecular, cellular, systems, and behavioral mechanisms related to AD pathophysiology, in addition to the means for evaluating potential therapeutic strategies (Götz and Ittner, 2008; Van Dam and De Deyn, 2011). Unfortunately, to date, little to no work has focused on the role of astrocytes and sleep in the development of AD or any other neurological disorders. The remainder of this review will describe the current state of AD research using various animal models and, where applicable, highlight how astrocyte research could be incorporated. Rodent models, and in particular mouse genetic models, have provided the most information regarding a causal link between Aβ and sleep disruption (Ju et al., 2014). In the Tg2576 AD mouse model (which expresses the familial human APP Swedish mutation), EEG δ power, a measure of sleep intensity, is blunted at all ages studied, and slow-wave sleep-associated EEG is shifted to higher frequencies in mice with plaque formation (Wisor et al., 2005; Zhang et al., 2005). Another study in Tg2576 mice observed disruption of REM sleep associated with plaque formation around mesopontine cholinergic neurons, cells necessary for normal REM sleep (Zhang et al., 2005). Using in vivo microdialysis, it was shown that diurnal oscillations in Aβ exist in the interstitial fluid (ISF) of brains of wild-type and Tg2576 mice, with elevated Aβ levels during wakefulness (Kang et al., 2009). Six hours of acute sleep deprivation or chronic sleep restriction (4 h of sleep per day for 21 d) also increased the levels of ISF Aβ, suggesting that circulating Aβ levels in the brain are regulated by wakefulness (Kang et al., 2009). In a follow-up study, diurnal Aβ oscillations in mouse brain ISF were observed only at ages before the formation of amyloid plaques, and were associated with normal sleep–wake behavior (Roh et al., 2012). However, disruption of normal diurnal Aβ ISF cycling correlated with both a progressive increase in the amount of age-associated Aβ aggregation and the amount of wakefulness during the period of normal sleep (Roh et al., 2012). Together, these data suggest that plaque formation in aged mice is negatively correlated with diurnal oscillations in ISF Aβ, maybe generated by a positive feedback loop consisting of wakefulness-induced elevations in Aβ release and Aβ aggregation-induced wakefulness (Gerstner et al., 2012; Ju et al., 2014; Lim et al., 2014). While mice have been the predominant AD model, over the past decade, other nonmammalian model organisms of AD have emerged, including invertebrates, such as the fruit fly Drosophila melanogaster and the nematode Caenorhabditis elegans, and alternative vertebrate species, such as the zebrafish Danio rerio (Wentzell and Kretzschmar, 2010; Van Dam and De Deyn, 2011). These species have been particularly useful for transgenic manipulations engineered to express amyloid mutations causing neuropathology that resembles what is observed in AD patients. In addition, limitations with current mouse models, which often fail to recapitulate all aspects of human AD, require alternative animal models to explore appraisal of early pathological processes (Van Dam and De Deyn, 2011). The fruit fly, D. melanogaster, has provided a strong molecular genetics approach to the research of behavior for decades, and its genome contains ∼70% of human disease-related genes (Fortini et al., 2000; Reiter et al., 2001). The use of the fruit fly to study neurodegenerative disease, including AD, is no exception (Bilen and Bonini, 2005). The APP belongs to a conserved gene family, which includes mammalian APLP1 and APLP2 genes, and the fly homolog, APPL (Luo et al., 1992; Iijima-Ando and Iijima, 2010; Cassar and Kretzschmar, 2016). Similar to APP, APPL can be processed by secretase enzymes and has been shown to yield secreted fragments, a neurotoxic Aβ-like peptide, and an intracellular C-terminal intracellular domain (Luo et al., 1990; Carmine-Simmen et al., 2009; Bolkan et al., 2012). A study demonstrated that increased β-cleavage of endogenous APPL by the β-secretase severely disrupted circadian behavior in flies (Blake et al., 2015). Many transgenic flies have been generated to model AD, with a variety of ways to express Aβ peptides (Iijima-Ando and Iijima, 2010). One group used triple transgenic flies that express human APP, along with two enzymes that cleave APP (human β-secretase and the Drosophila presenilin) to produce Aβ peptides (Greeve et al., 2004). These flies develop amyloid plaques with age-dependent neurodegeneration and lethality. Other groups used a more direct approach to express neuronal human Aβ in flies to determine behavioral and pathophysiological consequences. Overexpression of human Aβ in neurons produced amyloid deposits in the brains of flies and resulted in progressive memory loss, neurodegeneration, and premature death (Iijima et al., 2004). Similarly, another study showed that overexpression of a mutation of Aβ observed in humans with early-onset familial AD, called the Arctic mutant (E22G), resulted in increased severity of neurodegeneration compared with overexpression of nonmutated Aβ (Crowther et al., 2005). When Arctic Aβ was conditionally expressed at different ages, older flies had an increased susceptibility to Aβ toxicity (Rogers et al., 2012). These Arctic Aβ flies were observed to have progressive circadian rhythm deficits, even though they retained a functional molecular circadian clock (Chen et al., 2014; Long et al., 2014). These studies provide evidence for a role of Aβ in modulating circadian rhythms, and new evidence also suggests a role of Aβ on sleep in flies (Dissel et al., 2015; Tabuchi et al., 2015; Gerstner et al., 2017a). In addition to value to studying circadian rhythms, Drosophila also have robust sleep phenotypes established over a decade ago (Hendricks et al., 2000; Shaw et al., 2000), allowing for the opportunity to exploit the power of fly genetics and pharmacological approaches for the study of sleep, glia, and Aβ in AD. Tabuchi et al. (2015) first showed that Arctic Aβ accumulation in flies led to reduced and fragmented sleep, whereas chronic sleep deprivation increased Aβ burden. Using another AD fly model, Gerstner et al. (2017a) showed that increased Aβ expression in neurons similarly led to reduced and fragmented sleep, and this phenotype was rescued by overexpression of fatty acid binding protein, a lipid binding protein found in glial cells (Ahn et al., 2014). In a recent study, APPL inhibition in Drosophila glial cells resulted in higher sleep amounts, whereas glial APPL overexpression in flies disrupts sleep (Farca Luna et al., 2017), suggesting that glial APP plays a role in sleep–wake regulation. The Drosophila Presenilin mutants (PsnB3/+, PsnC4/+) show cognitive defects similar to AD, and pharmacological increase of sleep improves this cognitive impairment (Dissel et al., 2015). These studies were further extended to encompass both the (1) APP and (2) Beta-secretase Drosophila models of AD. As before, restoring sleep to these AD models was sufficient to restore functional senescence, short-term and long-term memory, and anatomical dysregulation to these previously impaired flies (Dissel et al., 2017). These data suggest that sleep can serve as a therapeutic to AD cognitive impairments in the fruit fly and provide a critical foundation of work that link sleep and AD. However, no studies to date have leveraged Drosophila to study the interaction between sleep, AD, and astrocytes, an area ripe for investigation. Another invertebrate model with a powerful genetic toolkit for dissecting AD is C. elegans. Only recently has C. elegans sleep-like behavior (lethargus) been described (Raizen et al., 2008; Nelson and Raizen, 2013). However, C. elegans offers a unique and largely unexplored model for the study of the role of Aβ and sleep behavior. The worm is a powerful genetically tractable model organism (Brenner, 1974) with a short (3 week) lifespan associated with an age-related decline in a variety of physiological processes, including pharyngeal pumping and body movement (Huang et al., 2004). While C. elegans have a simple nervous system comprised of 302 neurons, it has been estimated that ∼42% of human disease genes have some ortholog (Markaki and Tavernarakis, 2010). These features, along with the low cost, ease to maintain, and amenability for unbiased genetic and pharmacological screens, make C. elegans a desirable model for future studies in neurodegenerative research (Teschendorf and Link, 2009; Li and Le, 2013; Alexander et al., 2014). Indeed, several Aβ-transgenic AD worm models have already been generated, often with inducible- and cell-specific targeting systems, and have been shown to aggregate and produce age-related, progressive paralysis (Link, 1995; McColl et al., 2009, 2012). Gene expression studies have been examined in both transgenic Aβ AD models (Link et al., 2003), as well as during the sleep-like state lethargus (George-Raizen et al., 2014); therefore, a cross-examination of these two datasets may contain common molecular pathways that point toward a linkage between sleep and Aβ aggregation. C. elegans glia have also been shown to modulate neural activity and behavior (Stout et al., 2014). Similar to Drosophila, future studies using C. elegans along with bioinformatics, forward and reverse genetics, and pharmacological screens represent an important area of research to improve our understanding of sleep, glia, and Aβ. Like its worm and fly invertebrate counterparts, the zebrafish, D. rerio, provides an exceptional opportunity for the study of the interaction between sleep, glia, and Aβ. The zebrafish is a small fresh water tropical fish that is quite useful for large-scale genetic and pharmacological screens. Because of their large reproductive capacity, transparency of embryos and larvae, and given that they are vertebrates with similar organs and biological systems, along with ∼70% genetic similarity to humans (Howe et al., 2013), this makes zebrafish a more closely related model for the study of human disease (Lieschke and Currie, 2007), including AD (Xia, 2010), than worms or flies. While zebrafish have APP orthologs, and many of the genes related to the familial forms of AD found in humans (Newman et al., 2014), the precise role of Aβ and Aβ-related toxicity in zebrafish models of AD has been understudied. One study fused human Aβ to the promoter of mitfa gene to drive the expression specifically in melanocytes, in aims to produce a readily identified pigmentation phenotype (in the absence of zebrafish lethality) for screening drugs (Newman et al., 2010). However, a disrupted pigment phenotype emerged after 16 months, a time that is too late for drug screens in this model. Exposing zebrafish to Aβ in the aqueous environment resulted in developmental defects, and accelerated senescence (Donnini et al., 2010). A more recent study showed that hindbrain ventricle injection of Aβ in zebrafish embryos shows cognitive abnormalities in avoidance behavioral task performance, in addition to reduced survival (Nery et al., 2014). To date, a zebrafish Aβ model similar to what has been developed in other species, such as Drosophila, has yet to be generated. In contrast to established Aβ models in zebrafish, a sleep-like state in zebrafish has been well characterized by a number of groups (Zhdanova et al., 2001; Rihel et al., 2010a), and similar sleep–wake regulatory systems, such as the orexin-hypocretin system, exist in zebrafish (Yokogawa et al., 2007; Appelbaum et al., 2009, 2010). The transparency of zebrafish makes it a powerful model given newly developed imaging tools and techniques to uncover insight into how Aβ affects the normal molecular and circuit networks that generate sleep behavior in real-time (Chiu and Prober, 2013; Leung et al., 2013). Behavioral profiling combined with hierarchical clustering has revealed the diversity of drug effectiveness in zebrafish, and support this model for screens combined with Aβ (Rihel et al., 2010b; Rihel and Schier, 2013). Aging-related disruption of the circadian system, sleep, and cognitive performance have also been reported in zebrafish (Zhdanova et al., 2008). The similarity in ontological changes in sleep architecture between zebrafish and humans (Sorribes et al., 2013), which when combined with more targeted transgenic models of Aβ that have been successful in other species, would greatly facilitate advances in the field of sleep, glia, and AD. Alternative animal models, such as worms, flies, and zebrafish, have been underused in examining the contribution of astrocytes to the relationship between sleep–wake and AD, and represent a genetically tractable, quick and cost-effective means for evaluating this relationship. This fills a current need in AD research, which has been dominated by animal models (e.g., rodents) that are more expensive to breed and maintain. Together, these alternative animal models are powerful tools for the study of interactions between sleep, astrocytes, and Aβ. Future use of these alternative models will greatly facilitate our understanding of AD pathophysiology, and provide a tremendous opportunity and faster pace for significant advancements in AD research. Our hypothetical model suggests disruption of neuroglial metabolic coupling as a key mechanism underlying the positive feedback loop linking sleep–wake irregularities with Aβ aggregation in AD. Future experiments using genetic and pharmacological approaches against molecular targets responsible for brain reactivity to aggregates and ANLS will need to be tested. AD animal models hold a lot of promise for the characterization of such mechanisms and would be of great value to target discovery in the AD drug pipeline. Opportunities exist in multiple species, including worms, fruit flies, zebrafish, and mice, to examine the role of Aβ in aging and sleep. For example, current genetic tools and technology exist to study whether Aβ driven in neurons is able to disrupt sleep in Drosophila (Hendricks et al., 2000; Shaw et al., 2000; Iijima et al., 2004; Crowther et al., 2005). Because alterations in sleep may serve as a prodromal marker for AD, one simple question to first address is whether sleep disturbances are observed before Aβ-induced cognitive disruption previously established using existing genetic tools in flies (Iijima et al., 2004). Understanding how sleep influences astrocyte activation, inflammatory regulation, and Aβ metabolism is another important issue which can be addressed using cell-type-specific manipulation of astrocyte genetics in flies or mice. Finally, understanding the interplay between Aβ, sleep, and ANLS in the aging brain is of critical importance. The development and utilization of alternative animal models and new transgenic animals will undoubtedly add to our understanding of the relationships between sleep, astrocytes, Aβ, and AD. Given that sleep–wake behavior has been established in worms, flies, and zebrafish, transgenic Aβ models can be quickly generated and evaluated for changes in sleep behavior. With the evaluation and characterization of Aβ effects on sleep in more simple AD models, future work determining the therapeutic potential of pharmacological treatments can be streamlined, and interrogated first in these simple systems before more expensive and time-consuming higher-order and complex models. In conclusion, sleep disturbance is common in AD patients and may exacerbate AD pathophysiology. Studies in animal models and humans have shown increased levels of Aβ follow extended periods of wakefulness, and are associated with Aβ aggregation. Accumulation of Aβ has also been shown to fragment consolidated sleep, suggesting a causal link between sleep fragmentation with Aβ release, aggregation, and subsequent neurodegeneration. However, a critical understanding of the molecular and cellular mechanisms responsible for this feedback relationship between sleep, Aβ, and AD pathology has been lacking. In this review, we propose one mechanism that may contribute to this vicious cycle: the disruption of the ANLS neurometabolic coupling by astrocytes. We also emphasize the need for multiple alternative animal models, including the worm C. elegans, the fruit fly D. melanogaster, and the zebrafish D. rerio to examine the association between sleep, Aβ, and AD pathophysiology, and the role of astrocytes in this process. These models are well poised to evaluate and test the relationship between sleep–wake dysfunction, astrocyte activation, and Aβ aggregation. The development and characterization of these AD animal models are critical for our understanding of the relationship between sleep, Aβ, and AD, and the therapeutic potential of drug treatments. (2004) Sleep disorders in Alzheimer's disease and other dementias. Clin Cornerstone 6 [Suppl. 1A]:S16–S28. (2014) Amyloid-beta diurnal pattern: possible role of sleep in Alzheimer's disease pathogenesis. Neurobiol Aging 35 [Suppl. 2]:S29–S34. The exact etiology of Alzheimer's disease (AD) is not clear. Perhaps, it is safe to assume that the cause could be multifactorial with a combination of genetic and lifestyle influences. This Dual Perspectives article makes a case for sleep–wake disturbances as potential risk factors for AD. Indeed, studies indicate that AD patients experience more sleep disturbances and stay awake during night. Inversely, fragmentation and lack of sound sleep increase risk for decline in cognition, suggesting a possible predictive marker for an ensuing cognitive decline and incipient AD. This reciprocal relationship is also evident at the molecular level: that the accumulation of amyloid into plaques as judged by lower CSF Aβ42 levels were associated with lower sleep quality, and individuals reported to have sleep disturbances were shown to have higher amyloid accumulation. How does sleep affect amyloid accumulation and vice versa? Introduce astrocytes. Gerstner et al. argue that astrocytes are critical to the sleep-amyloid accumulation pattern through the astrocyte-neuron-lactate shuttle, which suggests that lactate released by astrocytes fuels the metabolic needs for excitatory synaptic activity. Increased glutamatergic tone associated with wakefulness bolsters lactate release. Gerstner et al. suggest that, in aging-induced sleep decline, the balance between Aβ production and clearance is disrupted through astrocyte-neuron-lactate shuttle, and this skews toward accumulation of Aβ. Much of this is credited to wakefulness and how it affects astrocytes' cellular clearance. What is fascinating is that the Gerstner et al. reason for amyloid accumulation is not increased amyloid production, but defective amyloid clearance, despite ample studies showing that increased synaptic activity increases Aβ production. We tend to agree with their model, at least for the cases of late-onset AD, where the evidence for increase in production is slim. Indeed, using a cellular model, we showed that at least for the majority of the genes associated with the risk for late-onset AD, there is not much evidence that increased production provides an etiological explanation (Bali et al., 2012). One of the explanations that we offered is that perhaps these gene variants, either without or with lifestyle alterations, influence amyloid clearance. The model of Gerstner et al. on how sleep disturbances could contribute to defective Aβ clearance fits well. In addition to microglia, astrocytes clear amyloid. Indeed, several lines of evidence show that meddling with astrocyte activation or proteolytic machinery (e.g., autophagy) through sleep disturbances can regulate amyloid clearance, as proposed by the Gerstner et al. model. One question that is not addressed by their model is whether sleep affects astrocytic clearance of Aβ. How about synaptic structures that are also shown to be eliminated through astrocytic phagocytosis? Also, while the narrative is specific for how sleep–wake cycle disturbances could affect astrocytic Aβ clearance in AD (arguably also because Aβ also affects lactate release and synaptic activity), it should certainly not be lost on us as to how these dysregulations could also steer other amyloid disorders of the brain.